Get the most out of Pinterest with this guide. Whether you’ve begun using this fast-growing social network or have only heard of it, this Pinterest guide will quickly show you how to use Pinterest and all of its features. 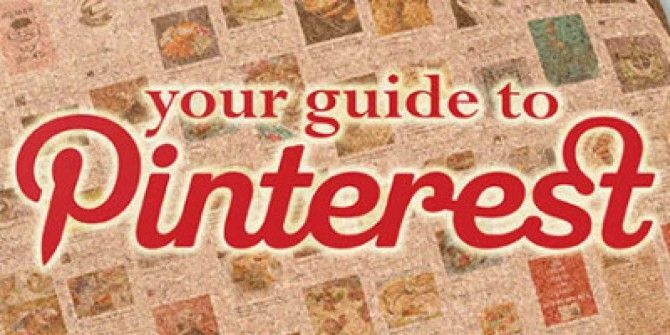 This guide outlines everything there is to know about Pinterest. This guide is available to download as a free PDF. Download The Unofficial Pinterest Guide now. Feel free to copy and share this with your friends and family. What is it about Pinterest that keeps users signing up and coming back? The combination of a beautiful interface and compelling content is the key to Pinterest’s success. By providing a way for you to save images to a single web page, Pinterest helps users easily organize and share content. You have probably heard that Pinterest appeals to women more than men. While the statistics show that Pinterest is, indeed, popular among women, my own anecdotal research leads me to believe that more men are using Pinterest than you might think. How are men using Pinterest? Notice anything? That’s right, men use Pinterest for many of the same reasons women use Pinterest. That’s because the way you use Pinterest is up to you! You can create a pinboard for any topic you can think of. Are you obsessed with engines? There’s a Pinterest board for that. Perhaps you’re crazy about Sriracha. Pinterest has got you covered. Give credit and include a thoughtful description. If you Pin from the source and give credit, other Pinterest users see where the original pin is from by clicking on the full-size image of the pin. This is especially helpful for products for sale. After all, what good is it to know a great product exists if you don’t know where you can buy it? Follow these Best Practices to learn how to use Pinterest and get the most out of it. Grab the “Pin It” bookmarklet from http://about.pinterest.com/goodies/. When you join Pinterest, you have the option of connecting via your Facebook or Twitter accounts, or you can sign up with your email address. Click the Join Pinterest button on pinterest.com. If you decide to sign up with your Facebook Login, click on the Facebook button, and then enter your Facebook login and password to connect to Pinterest. If you are already logged into Facebook, you will be taken directly to your Pinterest home page. When you login with Facebook, you have the option to allow Pinterest to post your activity to your Facebook Timeline. To log into Pinterest with Facebook, you must be using Facebook’s Timeline format. Perhaps you aren’t sure if you want to connect your Facebook and/or Twitter accounts to Pinterest yet. No problem. Sign up using your email address instead. You can always connect Pinterest to Facebook and Twitter later in Account Settings. Then click on the “Create Account” button, and you are good to go! Pinterest is not just for people. Businesses stand to benefit from promoting products on Pinterest. You can join Pinterest as a business or convert your existing personal account to a Pinterest Business Account at business.pinterest.com. Many businesses are using Pinterest to increase sales and interest in their brand and products. You can read a few case studies showing exactly how some businesses are capitalizing on the Pinterest craze. Then use what you have learned and grow your own business! After you have created your Pinterest account, the first thing you should do is install the Pin-It button (or “bookmarklet”) to your browser’s bookmarks bar. Get the “Pin It” button by hovering on the down arrow next to the About link in the Pinterest toolbar ribbon and clicking on “Pin It Button,” or by visiting http://about.pinterest.com/goodies/. Be sure your browser’s bookmark bar is displayed, and then drag the Pin It button to your bookmarks bar. Now when you are browsing the Internet, you can click the Pin It button in your bookmarks bar to pin an image. Every pin added using the Pin It bookmarklet links back to the website it came from. Let’s try it out! Visit any website you like that includes at least one image and then click on the Pin It button you just added to your browser’s bookmarks bar. When you click the Pin It button, your browser will display thumbnails of all the images on the page. Click on the image you want to pin. A popup window appears where you can choose which of your boards you want to pin the image to. You can (and should) enter a description of the image. If the image you are pinning is of a product for sale, include the price in your description. Pins that include price information will be indexed in the Gifts section of Pinterest.com where you can browse gifts in different price ranges. Once you have picked a board and entered a description, simply click the “Pin It” button, and you’re done! You now have options to See Your Pin and Tweet your Pin. You may close this window if you like, or, depending on which browser you are using, the window may close on its own. You can keep these default boards, rename them, or you can create completely new boards. We will learn more about how to use Pinterest to organize your boards and create Secret Boards in Chapter 6. “Following” other Pinterest users is a great way to discover new content. 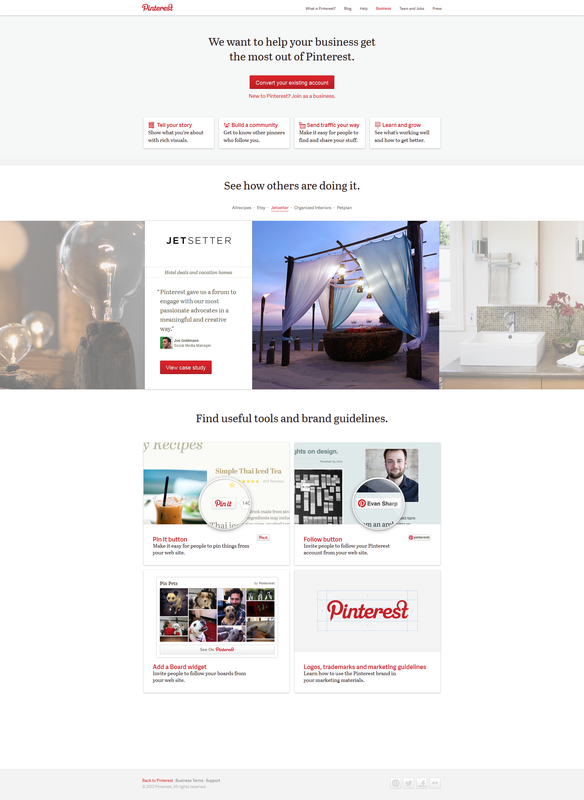 Your Pinterest Home page displays pins from people and businesses you follow. If Pinterest has suggestions of people for you to follow, they will be listed on the left side of your Pinterest home page. To follow a Pinterest user, click on the Follow button next to their name, or click on their name to reach their profile page. From any Pinterest user’s profile page, you can opt to Follow All or follow specific boards created by that user. “Liking” a Pin allows you to save that Pin without pinning it to one of your own boards. You can see everything you have “Liked” on Pinterest on the Likes tab of your profile page. Many people I’ve talked to say they never use the Like feature. If they like a pin, they always repin it to one of their own boards. Alternatively, many people use the Like feature to keep track of pins for which they do not yet have a dedicated board. You can always view the Pins you have Liked and pin them to a board later. “…I use ‘like’ [when] I see something that would make a great gift for someone who follows me on Pinterest. Likes are a great way of keeping track of said items without alerting said follower to its existence. It’s especially handy during the holiday season.” – Kat Li [via quora.com] *Note: Pinterest users who “follow” you can view your Likes, so this might not work if your followers visit the Likes tab on your profile page. Okay, it’s showtime. Your Pinterest home page shows recent pins from all the Pinners and boards you are following. On the left side of your Pinterest home page, you may see a list of Friends to Follow (if Pinterest has any suggestions, depending on if you have connected your Facebook or Twitter accounts). Following someone on Pinterest is just like following someone on Twitter or being friends with someone on Facebook. You will be able to see their pins, boards (except Secret Boards – more on that later), comments and likes. Click the Follow button next to a user’s name to follow everything they pin to boards they have created. If you only want to follow specific boards, click on the person’s name and then choose which of their boards you want to follow. Remember, you do not have to know someone personally to follow them on Pinterest. Branch out! You can also invite friends to use Pinterest or search for friends who are already Pinterest users. Click on the arrow to the right of your photo and name in the Pinterest toolbar ribbon and choose Invite Friends or Find Friends. You can either enter individual email addresses of people you would like to invite, or you can connect your Facebook, Gmail, or Yahoo! accounts. If you choose to connect an external account, Pinterest will display a list of your contacts from that account, and you can pick which of those people you want to invite to Pinterest. There is a reason your Pinterest home page displays pins from people you are following. By following someone (or someone’s board), you are saying that you are interested in that kind of content. Your home page, therefore, should be filled with pins you will like. Go to your Pinterest home page and click on a pin that catches your eye. Let’s take a look at what information is included with the pin. Clicking on a pin will display the full-size image of that pin. You can find a lot of different information here about the pin, including info on the original pinner and, of course, the original source of the image. Click on the full-sized image to visit the website the image originally came from. This is Pinterest at its best, connecting Pinterest users with the original creators of the things they love. Hovering your mouse over the full-size image of someone else’s pin reveals the Repin, Like, and Comment buttons. Click on Repin to pin the image to one of your own boards. Press the Like button to save the pin to the Like tab on your profile. To comment on a thumbnail view of a pin, hover your mouse over the thumbnail image and click the Comment button. To comment while viewing a pin in full size, type your comment in the comment box below the image. You can mention another Pinterest user in your comments if you are following at least one of their boards. Similar to Twitter, type the @ symbol followed by their username (ex. @username), and a list of potential matches will load, allowing you to click on the person you would like to mention in your comment. Similar to the “New Posts” message at the top of your Facebook News Feed, Pinterest notifies you if new pins have been posted since the last time your home page reloaded. Click on the New Pins link to view new pins. 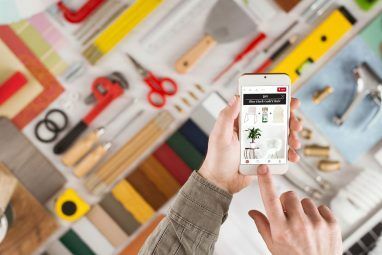 One small, but really nice feature of scrolling through the Pinterest home page is that, like the Energizer Bunny, it just keeps going… and going… and going. As you scroll, more Pins are loaded onto the page, and you can continue browsing beautiful pins from the people and boards you follow. If you want to jump back to the top of the home page, just click the “Scroll to top” tab that appears in the bottom right corner of your screen. Clicking on your name or photo in the Pinterest toolbar (at the top of the home and most other Pinterest pages) brings you to your profile page. This is where you can view and edit your own boards and pins. We will talk more about this later in Chapter 6, Your Pinterest Boards. The Settings screen is where you can manage your account settings and public profile information. This is also where you can deactivate your Pinterest account. Access Settings by hovering your mouse on the dropdown arrow next to your name in the Pinterest toolbar ribbon and clicking on the Settings link. Again, this is pretty straightforward. Under Edit Account Settings, you can update your email address, change your password, set your preferred language (as of January 2013, options include English, Spanish, French, Portuguese, Dutch, and German), and specify your gender (Male, Female, or Unspecified). You can also specify how often you receive emails about likes, repins, and follows (immediately or once daily) and whether or not you would like to receive emails with weekly recommendations. Finally, you can disable all emails from Pinterest by clicking the Disable Emails button at the bottom of this page. Your profile info can be entered and changed from the Settings page. Here you can change your first and last name, your Pinterest username, and your profile image. You have the option to upload a profile image, or you can click the “Refresh from Facebook” button, and Pinterest will use your current Facebook profile photo. The About field is your chance to share a little information about yourself with other Pinterest users. There is a 200-character limit, so choose your words wisely! If you own a website, you can use Pinterest’s Verify Website feature to show that you own the website on your Pinterest profile. Once you verify your website, a checkmark is displayed next to your domain in Pinterest search results, and your full website address and checkmark are displayed on your Pinterest profile. The steps for verifying your website depend on a few variables. A post dated October 24, 2012 on support.pinterest.com says, “Right now, you can only verify a top-level domain, such as www.example.com. For most bloggers, we recommend using the HTML meta tag option to verify your blog. Unfortunately, WordPress users won’t be able to verify their blogs at this time.” See support.pinterest.com for more information on how to verify your website. Do you want search engines like Google and Bing to include your Pinterest profile in their search results? You can turn Search Privacy on or off on the Settings page. Turn Search Privacy to the “Off” position to prevent your profile from appearing in search engines results. At the bottom of the Settings page, you can manage a few options related to your social network accounts. Options for Facebook include logging in with your Facebook account, publishing your Pinterest activity to your Facebook timeline, and a button to find Facebook friends on Pinterest. If you prefer to login into Pinterest with your Twitter account, you can activate that feature here. Here is another way to access your account settings: click the Edit Profile button on your profile page, located on the toolbar above your boards. Boards are the way you organize your pins on Pinterest. View your boards on your Pinterest profile page, accessed by clicking on your name or profile image on the Pinterest toolbar at the top of the page. 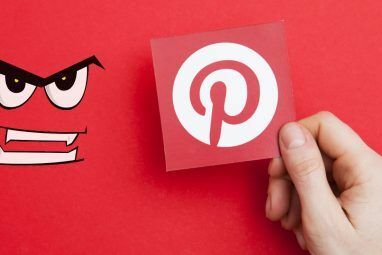 Pinterest recently launched “Secret Boards.” Secret Boards are just that – boards that are secret and only viewable to you and people you have authorized. Currently, you can create up to three Secret Boards. Secret Boards are great for keeping track of gifts and other surprises for the people in your life. But that isn’t the only way to use Secret Boards. Party planning, wedding details, guilty pleasures ­­­– all of these are great candidates for Secret Boards. In short, create a Secret Board for pins you would prefer to keep to yourself or a select group! Here’s a quick case study: Mata Traders, a small fashion business in Chicago has been using Secret Boards on Pinterest as a way for their designers to collaborate. While they don’t want the public viewing their designs just yet, these fashion designers are using Pinterest to quickly and effectively exchange ideas and inspiration among themselves. Click on the Create a Board link on your profile page to begin a new pinboard. You can also choose who is allowed to pin to your new board. Inviting other Pinterest users to pin to your board is a great way to collaborate. From your profile page, clicking on one of your boards will display everything you have pinned to that board. Unfortunately, at this time you cannot rearrange the order of the pins on your boards. They are displayed in the order you pinned them, newest first. Many people would like to be able to rearrange their pins. Pinterest has a great track record of rolling out user-requested features, so I would bet this feature will be available in the not-so-far future. While you cannot rearrange pins on your board, you can edit some features of an existing board. Click on one of your boards on your profile page, and then press the “Edit Board” button below the board’s name (or alternatively, click the Edit button below your board on your profile page). This screen allows you to edit the Title, Description, and Category of the board. You can also invite (or remove) collaborators – other people who are allowed to pin to your board. Pinterest allows you to pick which of the pins on a board is used as the board cover.There are two ways to choose a board cover. From your profile page, hover your mouse over one of your boards, and an “Edit Board Cover” button will appear. Click it. Now you can click through all the images on that board and choose one to be the board cover by clicking the “Set Cover” button. Alternatively, you can click on one of your boards to view all the pins on that board. Hover your mouse over any pin, and a “Set Board Cover” button appears. Click on the Set Board Cover button on whichever image you would like to set as the board’s cover. Let’s go back to your profile page that displays all of your boards. If you want to rearrange the boards on this page, just click on the Rearrange Boards button located next to the Edit Profile button on your profile page. Now you can drag and drop your boards to reorder them. Click the checkmark button when you are finished to Save Arrangement. We already covered how to pin images from around the internet using the Pin It button in your browser’s Bookmarks bar. Did you know there are other ways to create a pin? Click on the “Add+” link in the top right corner of virtually any page on Pinterest.com. You will be presented with three options: Add a Pin, Upload a Pin, or Create a Board. Why would you want to add a pin this way rather than using the Pin It bookmarklet? Say, for example, you are browsing the internet from a friend’s computer and you come across an image you would like to pin to one of your boards on Pinterest. Even if your friend has the Pin It button on their browser’s bookmarks bar, it will be connected to your friend’s Pinterest account, not yours. What to do? Simply log into Pinterest.com and click on the “Add+” link at the top of the page. Then click on “Add a Pin” and paste (or type in) the URL of the page on which you saw the image you want to pin. Then click on the Find Images button. Click through the images until you find the one you want to Pin. Choose the board you want to pin the image to and enter a description of the pin. Then click the Pin It button, and you’re done! While Pinterest focuses intensely on images (after all, what’s a pinboard for? ), descriptions are very important, too. First, adding a description makes it much more likely that other users will Repin or Like your image. Following best practices, enter a thoughtful description of the pin, including price information if it’s available. Pinterest makes embedding a pin on your website easy by providing the code for you. When viewing a full-size pin, you will see an Embed button to the right of the image. Clicking on the Embed button displays a screen where you can modify the width and height of the image and copy the resulting code to your clipboard. When you are logged into Pinterest.com, your home screen displays the newest pins from the people and boards you are following. To explore other parts of Pinterest, click on one of the links below the Pinterest logo at the top of the screen: Categories, Everything, Popular, or Gifts. Just like it says, clicking on the Everything link displays all recent public pins. This is a great way to discover interests, people, and products you didn’t even know you liked! Check out what is gaining traction on Pinterest by viewing popular pins. This is one of the best features of Pinterest. Hover your mouse over the Gifts link and choose a price range. Pinterest will display pins that include price information. Not only can you use this to find great gift ideas, but it’s fun to browse big ticket items in the $500+ category. From time to time Pinterest will promote a special event like “30 Days of Pinspiration.” Keep an eye out for links to special events and promotions. Pinterest says, “It’s best to report specific pins to help our team find the inappropriate content. But, if a profile has a lot of inappropriate content, you can report the whole user.” Report a user by clicking on the flag icon on the right-hand side of the user’s profile information on their profile page. To report an objectionable comment, view the pin in full-size and click on the flag to the right of the comment. Blocking another user on Pinterest means that person cannot follow you or interact with your pins, and vice versa. You won’t be able to follow the person you block or interact with their pins. To block a user, visit their profile page and click the flag icon to the right of their profile info. Pinterest actively supports feature requests from users. If there is a Pinterest feature you would like to suggest, visit support.pinterest.com and submit your idea. Current popular feature requests include “Warn Me If I Pin Something Twice,” “Reorganize Pins,” and “Sub-boards.” Show your support for a feature you’d like to see by voting for your favorite! Collaborating on Pinterest is as easy as adding another user as a contributor to a new or existing board. Create a new board or go to an existing board and click the Edit button. In the “Who can pin?” field, enter the name or email address of the person you want to invite to contribute. Pinterest notes in their blog, “You must follow at least one board belonging to the Pinner you want to invite in order to add him/her as a contributor.” Click the Invite button. Pinterest apps are available for Android devices, iPhones, and iPads. These apps are essential for users who want to Pin with their device cameras. The Pinterest app is available in the Google Play market for free. It currently requires Android 2.2 and up. Pinterest is also available for free via iTunes and was designed for both iPhone and iPad. The app is optimized for iPhone 5 but is compatible with several previous device versions. See iTunes for compatibility requirements. Not only can Pinterest be a great source of inspiration for your own website or blog, you can also use Pinterest to promote your own content. Pinterest provides a suite of tools to help integrate Pinterest into your website. Pinterest provides a number of styles of follow buttons for your website. Access them at http://about.pinterest.com/goodies/. Pin It buttons for websites invite your readers to pin your content on Pinterest. According to Pinterest, “The Pin It button is made to look and feel like the Facebook and Twitter buttons your readers already use. For best results, place the Pin It button near your other social sharing tools.” Get the Pin It button for websites at http://about.pinterest.com/goodies/. If you would like to prevent people from pinning images from a website you own, Pinterest provides a small piece of code you can add to the head of any page of your site. For more information on how to prevent specific photos from being pinned on Pinterest, Practically Functional has a good article on the subject. Pinterest does not have a public API. However, you can fill out a form to be notified when the public API is ready. Hopefully, you now have a good understanding of what Pinterest is and why you might want to join. To recap, Pinterest is filled with beauty, humor, and practical advice. Use Pinterest to track interests, hobbies, and products. Use Pinterest to get organized. Use Pinterest to get inspired. Use Pinterest to connect with the world around you. Explore more about: Longform Guide, Pinterest. It is a free to use tool that runs on the cloud and is optimised for all mobile devices. It has the Pin Scheduling feature, which means you can schedule as many pins as you like. I am the director of a new Professional Makeup Academy. Can I show the makeup students pictures from Pinterest with out contacting the source? The pictures would not be published just shown in the classroom. Thanks, Sally please respond asap! How can I see friends likes on Pinterest? How to add pinterest on blog? While trying to connect Pinterest to Facebook using the Pinterest settings button and making the Facebook login connection 'yes', it does not save after hitting save button. Why is this and how to save it so that it connects to Facebook. I have a question: what happens when i ignore someone's group board invite? do they know I ignored them? this really didn't answer the simple question of how to delete others pins and followers when the screens don't match your in the menu. I didn't gain anything by going through this material.